Tuolumne Meadows is in the high country of Yosemite National Park, at an elevation of 8,600 feet, offering visitors unique adventures of hiking, rock climbing and much more. Tuolumne Meadows Yosemite is a sub-alpine meadow on the Tuolumne River, coming to life in the spring and early summer when the wildflowers bloom. Tuolumne Meadows Yosemite National Park is accessed by driving the Tioga Road about one and a half hours northeast of Yosemite Valley. Tioga Road closes in the winter, but is generally free of snow from June through October. Tuolumne Meadow is the place to come to find some of the best activities to enjoy within Yosemite. Arriving in the late spring to early summer will provide a lovely view of wildflowers, including the rare Purple Webber. Looking southward you’ll see the breathtaking Cathedral Range and to the north Mount Dana and Lembert Dome. Numerous trailheads exist at Tuolumne Meadows. You can embark on a long trek to the top of Mount Lyell, which is the highest peak in the park. The Sunrise Lakes trail takes you up to the lakes and Cloud’s Rest, a 7.4-mile hike if going all the way. The popular Cathedral Lakes trail is part of the John Muir Trail, and you can go for a day or on an overnight backpacking trip. There are many other fabulous trails, both short and long. You’ll find 11 major domes and many minor ones for some short to medium climbs around Tuolumne Meadows. Above Tenaya Lake you can climb the Stately Pleasure Dome and on the east side of the meadow, the Lembert Dome invites you to scale its face. Some of the others are Pothole Dome, Fairview Dome and Tenaya Peak. 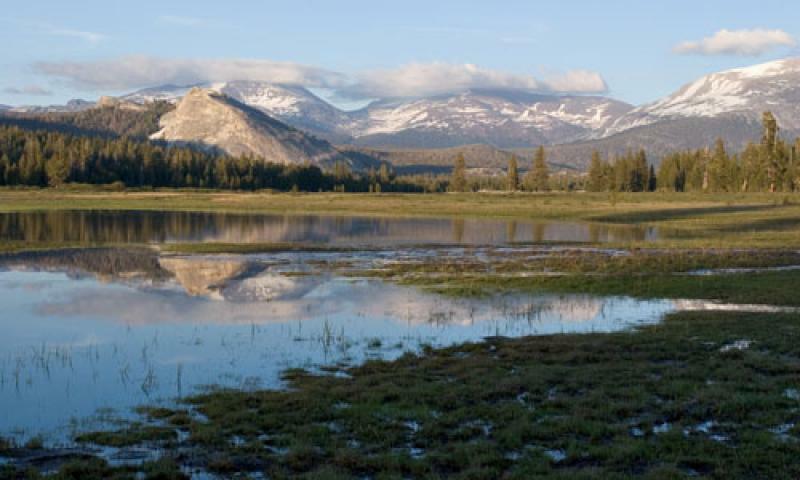 The Tuolumne Meadows Campground is open from July through September, depending on conditions. Here you’ll find 304 sites with fire rings, food lockers and picnic tables. Yosemite Tuolumne Meadows is fed by the Tuolumne River, which runs a total of almost 150 miles from the central Sierra Nevada to the central valley and the San Joaquin River.